Posted on December 5, 2014 by Dr. Grant	in News. The SC Card Game is designed for children and teens with Autism Spectrum Disorder, social skill difficulties, and communication struggles. Neurotypical children and teen clients can benefit from playing the SC Card Game as well. The cards are designed to work on social skills,communication skills, and relationship development. The Card Game can also be used as an assessment tool and to help build rapport with clients. The card deck comprises four categories of cards: answer the question, top 3, what if, and complete the sentence. The SC Card Game comes with 100 cards, a carrying bag, one dice, and instructions on how to play three different games using the SC Cards. 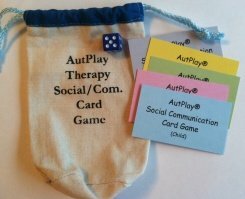 The SC Card Game can be ordered through the AutPlay Therapy website at www.autplaytherapy.com.